We are engaged in offering our clients wide range of Horn Jewelry Box. Procured by our reliable vendors, these are fabricated using premium grade basic material. We supply all the Horn Jewelry Box in compliance with international standards and are appreciated for strength, durability and corrosion resistance. Further our wide range of Horn Jewelry Box is available in various designs, colors and at market leading prices. Backed by highly developed infrastructure amenities and a team of professionals, we have been engaged in manufacturing and exporting finest array of Bone & horn handicrafts, gift wares and speak volumes With all Type Horn & Bone Blanks Raw Material. 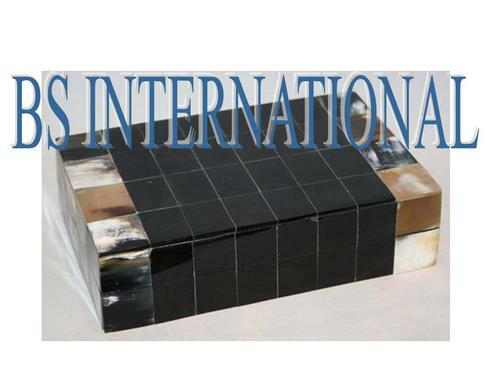 Our wide range of products includes All Type Indian Horn Bone Artware Products , Horn & Bone Button Blanks,Plates,Toggles,Chess Set, Photo Frame,Box, Gutka Folding Stool, Horn Steamed Fertilizer, Horn Comb, Tea Coaster, Wooden Box, Horn Round Frames, etc. The products we are offering our customers are manufactured using the premium quality raw material and are in accordance with international standard. Further, the basic material is procured from reliable vendors of the market. One of our major clients is Mr. R. Hubery. These products have massive demand in the international market for their exquisite designs, striking colors, superior polish and excellent finish. We are offering our extensive range of products as per the specific requirements of the customers. Our customers can avail these products from us at market leading prices. Backed by a team of quality control experts, we make sure that our products are of unquestionable quality. Owing to our supreme quality products and efficient management, we have obtained huge market base all across the globe which includes Indian Subcontinent, South/West Africa, East Asia, South America and North America.